Proper training begins with proper facilities and equipment. For law enforcement agencies, the fiscal year is coming to a close – making now a great time to use that extra budget for needed range equipment, upgrades, and services. For agencies looking to upgrade while still saving money, Action Target | Law Enforcement Targets offers a number of programs to help law enforcement departments supplement their budgets without skimping on their ranges. Recycling brass is a great way to reduce costs without cutting into budgets – and if done right, can mean more money for the range. The Law Enforcement Target Brass Program allows departments to recover money on their spent brass by applying credit to their account. 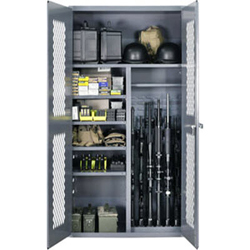 The department then receives credit that can be used toward any Action Target or Law Enforcement Targets product or service including portable targets, range services, spare parts, or even range upgrades. Credit earned through the program never expires and can be accumulated over time for larger purchases. One agency accrued over $60,000 through brass trade-in alone. The process is simple: a range master collects the spent brass and securely fastens the containers to a pallet. The range master then contacts Law Enforcement Targets at 800-779-0182 and schedules a time for the brass to be picked up. The brass is picked up and sent to a local recycler, sorted, inspected and weighed. The freight cost will be taken out of the credit received. 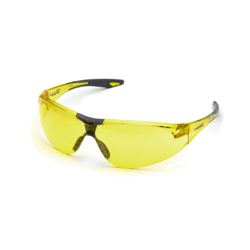 The range master is then contacted by Law Enforcement Targets with the credit amount based on the net weight of the brass which is competitively priced based on current commodity pricing. 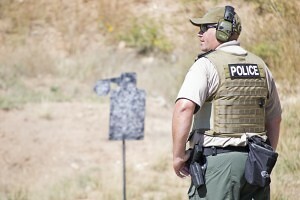 Action Target | Law Enforcement Targets is a turnkey provider for Gun ranges and training facilities. With the Brass Program, departments can use the credit for range parts/services/range consumables including de-Lead products, eye and hearing protection, general use products or products for resale. Guns and ammunition can also be converted to credit. Action Target works with PoliceTrades.com to help agencies receive revenue from ammunition, duty firearms, confiscated guns, and even restricted Class 3 weapons. PoliceTrades.com works through a bidding process. An agency sends a list of firearms it is looking to remove, and PoliceTrades.com sends it to a bid network of Federal Firearms Licensed Dealers (FFLs). FFLs then bid, and the highest bid is presented to the agency for review. Once accepted, the agency ships to the FFL and receives credit toward Action Target products and services. This process works for both duty and confiscated firearms. A similar process is available for Class 3 firearms (select-fire and short barrel rifles and shotguns). PoliceTrades.com handles all of the ATF Form 5 transfer paperwork, so departments don’t have to worry about trudging through all of the red tape. PoliceTrades.com also has a parts stripping and destruction program. Agencies can receive revenue through having old or confiscated firearms destroyed. 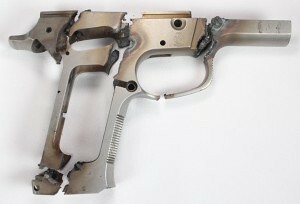 Guns are stripped of valuable parts such as the slide, recoil springs, grips, and magazines while the serialized frame of the firearm is destroyed. The agency receives revenue from the parts as well as a certified letter detailing the serial numbers of the firearms and the date they were destroyed. 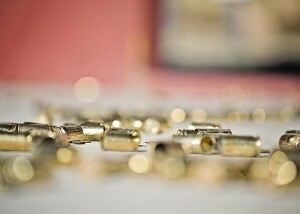 For more information on the brass trade-in program, the PoliceTrades.com programs, or any of Action Target’s products and services, call 801-705-9113. With the downturn in the economy and shrinking tax dollars, law enforcement agencies are searching for new sources of funding for needed equipment. PoliceTrades.com is helping law enforcement agencies find additional revenue through the trade of department firearms. Whether it be duty firearms, confiscated guns, or restricted Class 3 weapons, PoliceTrades.com is turning obsolete firearms into new equipment. The PoliceTrades.com trade program is simple and completely free for law enforcement agencies. A list of firearms the agency is looking to eliminate is obtained and sent to the PoliceTrades.com bid network of Federal Firearms Licensed dealers (FFLs) for pricing. By using multiple vendors, PoliceTrades.com can obtain the highest trade value for the firearms. The highest bid is then presented to the agency for review. Once the bid is accepted, the agency ships the firearms directly to the FFL for resale. 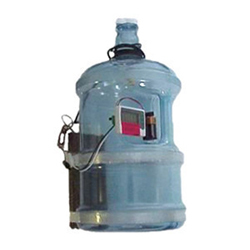 Payments are then made to the agency or to any vendor of the agency’s choice like Action Target. By paying a vendor directly, PoliceTrades.com ensures the money obtained through the traded firearms is used for the equipment needed by the agency. For example, your police department could be in need of outfitting its outdoor shooting range with additional targets or equipment, but not have the funds to do it. Instead of trying to raise the money or fighting with local government to increase funding, you can turn obsolete firearms into credit with Action Target or any other vendor you choose. 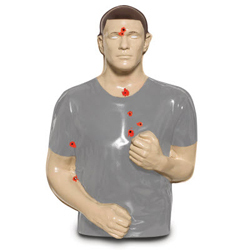 Action Target has been a corporate partner with PoliceTrades.com for the last few years and encourages law enforcement clients to utilize this opportunity to get the quality equipment and targetry they need to train effectively. Many agencies are burdened with large inventories of confiscated and surrendered firearms. Evidence rooms fill up and agencies need a solution to eliminate this excess inventory. PoliceTrades.com offers several solutions to deal with confiscated firearms. One option, PoliceTrades.com can bid on the firearms as they would duty weapons, where they would be resold through licensed firearms dealers. The destroyed frame of an S&W 4006. Another option is the parts stripping and destruction program. With this program, agencies can get paid while having the firearms destroyed. This is accomplished by stripping the guns of the valuable parts (i.e. slide, recoil springs, grips, magazines) and having the serialized frame of the firearm destroyed. 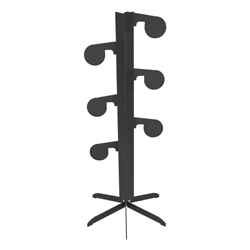 This ensures the firearm will never be used again, yet provides funding with the parts value. The agency is also provided with a certified letter, detailing the serial numbers of the firearms and the date they were destroyed. Class 3 firearms (select-fire and short barrel rifles and shotguns) are another area where PoliceTrades.com can help you obtain revenue. Some agencies are under the impression that these guns can only be transferred to another agency. Through their Class 3 FFL dealers, PoliceTrade.com can purchase transferable Class 3 firearms for resale value and non-transferable firearms for parts value and destruction. PoliceTrades.com will handle all of the ATF Form 5 transfer paperwork. PoliceTrades.com is the industry leader in the firearms trade business and can help your agency find untapped revenue sources. For more information, you can contact them directly via phone at (636) 536-2288 or mailto: Bids@PoliceTrades.com.